Matheronodon is certainly a dinosaur worthy of a bigger bite. With proportionally giant teeth strikingly different from the standard-issue ornithopod dinosaur, it is certainly one of the most important dino discoveries out of Europe this year. Better yet, the original scientific paper by Pascal Godefroit and colleagues is free to read in the journal Scientific Reports! If you’d like to learn more about Rhabdodontidae, the small but successful family of dinosaurs to which Matheronodon belongs, check out the papers in the reference list below. The head of Matheronodon, complete with gigantic teeth in its jaws. 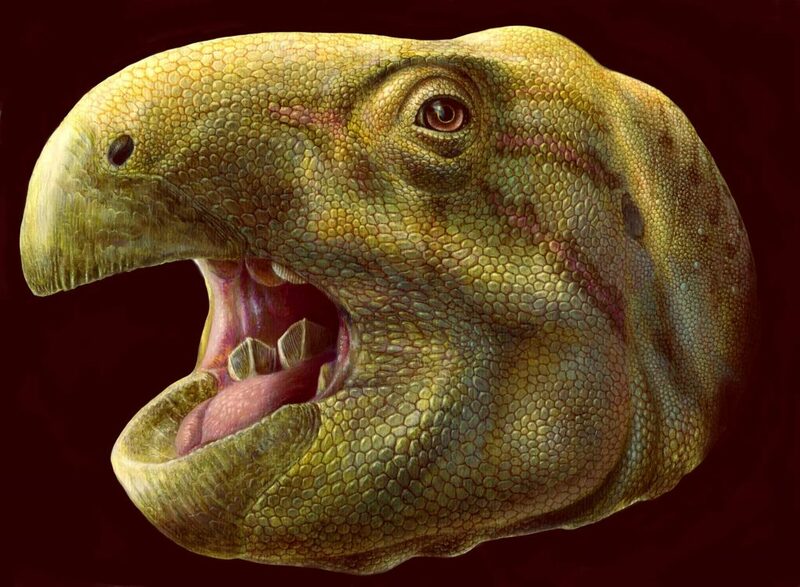 This illustration by Lukas Panzarin reconstructs the whole head similar to other rhabdodonts, like Rhabdodon and Zalmoxes. The original specimen (pictured below) is housed at the Musée du Moulin Seigneurial in Velaux, France. I looked up the museum online, and it looks really cool. Built in an old olive mill, the exhibits include Cretaceous in Provence displays. The displays include specimens of Matheronodon contemporaries, including the sauropod Atsinganosaurus velauciensis, the crocodile Allodaposuchus, and ancient turtles. If I get a chance to visit, I’m hoping the Matheronodon teeth and jaws will be there too! Figure 1 of the paper by Godefroit et al. (2017), illustrating the right maxilla of Matheronodon with its giant teeth. Our guest this episode was Dr. Ali Nabavizadeh, who was not actually involved in the study. But, he is one of the most knowledgable scientists working on dinosaur jaws! His work focuses on the evolution of eating in herbivorous animals. His early work focused entirely on dinosaurs, but he has branched out into other plant-eating reptiles and mammals. Ali’s work was featured on a classic episode of Past Time on just how different dinosaur bites could be. You can visit his research website, and, if you are a student at the Cooper Medical School at Rowan University, he might be your anatomy professor! Follow him on Twitter for something to chew on! 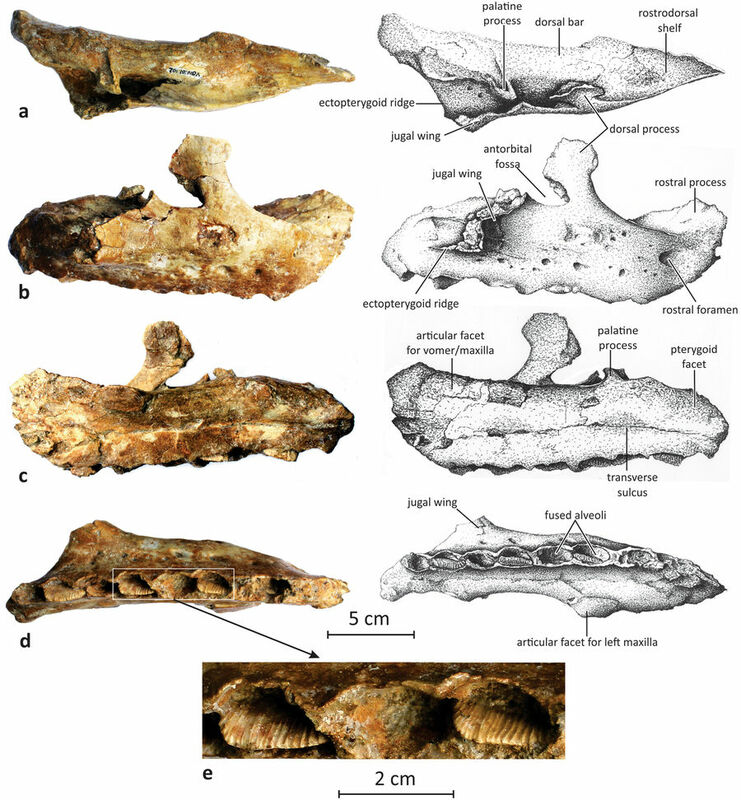 The new paper describing Matheronodon. Godefroit, P., Garcia, G., Gomez, B., Stein, K., Cincotta, A., Lefèvre, U. & Valentin, X. 2017. Extreme tooth enlargement in a new Late Cretaceous rhabdodontid dinosaur from Southern France. Scientific Reports, 7, 13098. An older paper led by Dr. Godefroit on Zalmoxes, a much more completely known rhabdodont from Cretaceous Romania. Godefroit, P., Codrea, V. & Weishampel, D. B. 2009. Osteology of Zalmoxes shqiperorum (Dinosauria, Ornithopoda), based on new specimens from the Upper Cretaceous of Năălaţţ-Vad (Romania). Geodiversitas, 31, 525–553. A paper led by Hungarian researcher Attila Osi about the biggest and smallest rhabdodonts from Europe. Osi, A., Prondvai, E., Butler, R. & Weishampel, D. B. 2012. Phylogeny, histology and inferred body size evolution in a new rhabdodontid dinosaur from the Late Cretaceous of Hungary. PLoS One, 7, e44318. Dr. Nabavizadeh’s paper on the diversity of chewing in the ornithschian dinosaurs. Nabavizadeh, A. 2016. Evolutionary trends in the jaw adductor mechanics of ornithischian dinosaurs. The Anatomical Record, 299, 271–294. Be sure to check out Past Time on Twitter and Facebook. Give us a review on iTunes if you get the chance too!